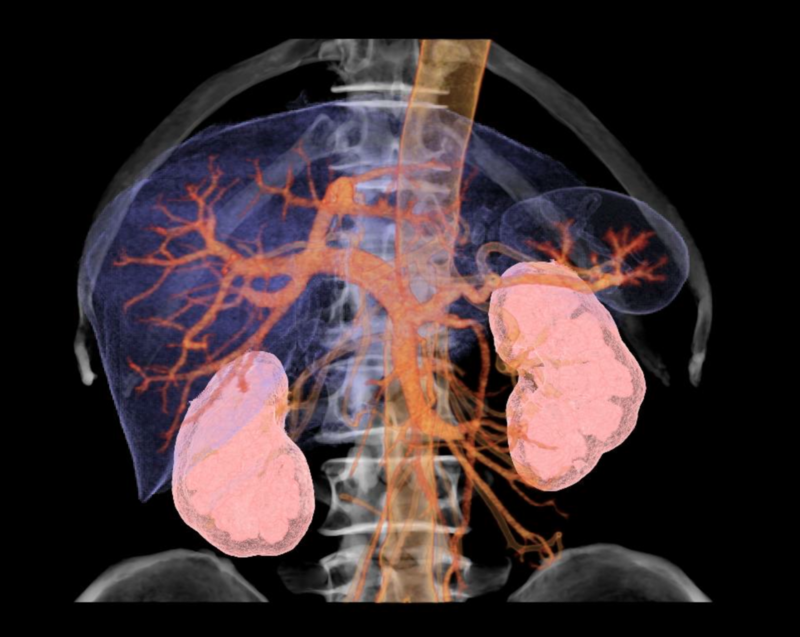 Provides an extensive range of patented iNtuition™ clinical and workflow tools for specialists using CT scanning for organ analysis and quantification. This package provides features including semi-automated liver segmentation, lesion definition with volume measurement, classification of vasculature, and vascular centerline distance measurements for invasive treatments. The intuitive sphericity index is designed to help physicians identify and manage sphere-like structures. The user friendly workflow guides the user through fine-tuning segmentation both semi-automatically and manually. Display of lesion-to-vascular relationship and lobular segmentation with a multi-cut option for pre-surgical planning are also supported. When image noise is a concern, dynamic image filtering with configurable filtering strengths can be engaged to improve reading efficiently. TeraRecon iNtuition Solution Clinical Packages include iNtuition and AquariusAPS. The Lobular Liver workflow uses APS results to automatically segment the liver and provides tools to edit the segmentation appropriately including creating centerlines. Using the AQI toolset, the user is able to isolate abnormalities from the liver to create a separate 3D volume and create a transection plane. Select a liver study from the patient list. Load selected study into the Lobular Liver workflow. Automatically segment the liver using APS results. Click "Segmentation" to start the Lobular Decomposition workflow. Click "Liver" to use APS results to automatically segment the liver if this had not been done previously. Click the overlay button to visualize the segmentation on the MPR images. Use these easy to access tools to edit the segmentation appropriately. Click the camera icon to take a secondary screen capture and save the segmentation mask. Click "PV" to segment the Portal Vein. Edit and verify that the CPR lines are correctly placed. Click "Other Part" to begin selecting the liver abnormality. Using the bottom tool panel, segment the liver abnormality. Make sure to "Select" the Region of Interest. Name the abnormality and click the camera icon to save the mask. Click "Simulation" to prepare a transectional cut line. Hold shift and drag across an axial, coronal, or sagittal view to make a transection plane. Use ALT to nudge the plane if desired. When you are satisfied with the transection plane hit the "Cut" button. The volume of the remaining part, as well as the percentage of the volume, will be displayed in the 3D view. Click "Auto territory segment" to begin labeling and segmenting the eight functional lobes of the liver. The liver lobe volumes are displayed in the 3D viewer. Download our Truly Advanced Visualization eBook to learn about the most important dimensions of your decision. Active Client Software Access Points across 74 countries. Ready to get started? Your free consultation is just a click away! ©2016-2018 Terarecon, Inc. All Rights Reserved.